« FAIL: 34 years and billions of dollars… for what? Well then he should leave Australia, as bushfires in Australia will occur regardless of global warming. Warmer makes them worse, but they will always be there. It is part of the landscape, but then Greens have never been naturalists anyway. Time to start suing Councils/Greenies/both for damages – anyone who obstructs proper fire risk reduction practices like back burning ( i.e. called common sense ) is placing the community at heightened risk. Simon, you’d better add Labor Senator Doug Cameron to the list of ‘morons’. Doug seems to have forgotten that he is no longer part of the governing party. The last time his lot of cavalcading berserkers ran riot in Parliament House was 1996. That was a real problem. If every bit of common sense was collected from all the Greenies it wouldn’t fill a thimble. Brandt is doing a wonderful job of consigning his party to a dismal history. Go Adam. We out here in the common sense world are not as dumb as you and your believers think we are and can see you for the buffoon that you are. Simon, I wish that I had your confidence in thinking that idiotic statements from Bandt et al might drive the green zealots to the political sewers, but because our education in general and science in particular EDUCATION has been dumbed-down, there are still millions to whom such words resonate. But I got my biggest fright a few nights ago when Greg Hunt, explaining the virtues of his so-called Direct Action’ said on Lateline that he “believed in the science”. He simply went on to say that his way of mitigating CO2 was better than Labour’s way. If he believes the science, where do we go now? Me too. I just have heard the same words from Hunt. Its time that Tony Abbot puts the warmists to rest (killed them off) with some of the facts about the climate, the IPCC et al. Tony was right when he said the science was crap. It simply is. Maybe Hunt wasn’t listening? And a consensus (even if one existed) is politics and not science. Maybe Tony should employ some one the sceptical side of things (…..like Labor hired Flannery) to put together an educational programme exposing the madness of what the warmists spout all of the time. Maybe someone like Carter, or Plimmer? Why not Monckton? He could start with one of his own party, Dennis Jensen. Some green policies themselves in recent decades contribute to worsening effects on communities from bushfires, such as: residents not being allowed a buffer or fire break between their homes and vegetation and/or not being allowed to clear vegetation and re-growth near their homes, (which was not always the case when the homes were first located and built); encouraging re-growth and growth nearer to houses and communities; the scaling back of fire access trails; changes and reductions in forest management practices including sustainable logging in certain areas which kept re-growth and fuel loads down-especially those nearer to communities; not allowing some developments which would ordinarily buffer communities such as golf courses and parks adjacent to areas of thick vegetation, etc etc. These policies are sometimes only minor and wont do all that much against megafires, but they can and do make things worse, on occasion for communities. In particular, people should be allowed to clear vegetation and protect their property which are near vegetated areas, particularly when that was the case when the homes were first built. Converting areas of former logging, especially those which kept fuel loads from building up, to National Parks also has a strong effect on bushfire intensity and effect, especially nearer to communities. When National Parks and other conservation areas are proposed, especially in areas of former logging which kept fuel loads down, such an effect on surrounding communities rarely gets a mention. Such green policies occasionally therefore make the bushfires worse. One step forward is greater planning restrictions in building houses and other public infrastructure near to high fuel load forested areas, but this doesn’t address those areas where the homes are already built. Although most photographs show the devastation of rows of houses one shows a house that did not burn next to two that were destroyed. The aerial photo is in the Weekend Australian page four Rohan Kelly took it. I can’t find it on Google. In all cases the bush is right up to the back fence.The house that survived was cleared of scrub front and back and has non native looking evergreen shrubs protecting the back wall. The experience of the Ash Wednesday fires and the more recent Victorian ones is that you need to reduce fuel and have fire breaks to have a chance of survival. Present policies of fire mitigation lead to a complete hot burn under far from ideal conditions destroying people their homes and the local wildlife. Remembering back to my adolescence in the 60’s the whole of the Blue Mountains went up in flames. Why do we keep repeating these mistakes of the past? Greenies are so ignorant. They don’t know basic science. A cold front in spring separates desert air from air of recent Antarctic origin. What’s knew? Bushfires in Blue Mountains and new snow on Mt Perisher at the same time. Absolutely standard spring weather. Apple growers on tenterhooks as they see squall lines approaching; hail in the offing. Trees getting blown over in Victoria. Mother nature doing her thing. There is no mysterious process going on. The front has passed, and there’s not much difference between the temperatures from Sydney to Hobart. If anyone is to blame for the fires it is greenies who interfere with fuel reduction. Farmers in Tasmania were not allowed to do winter burning because the swift parrots and wedge-tailed eagles might have got their feathers ruffled, and what happened? The birds’ habitat, along with the farmers’ livelihoods, was utterly destroyed on one hot, windy day last January. Let’s do some maths. Count the number of Greens in the Senate. Now count the number of villages missing idiots. The numbers should match. They don’t mind massacring birds with windmills … that’s ok.
Bill Gammage, “The Biggest Estate on Earth” is now available in paperback. I’m hardly half-way into the book, but it looks like it covers the subject. It’s a superb book, Martin Clark, if we had any sense we would try to learn from the original inhabitants’ excellent land use and management. For one thing, we would not now be losing so many homes and lives to fire. Definitely a prat. 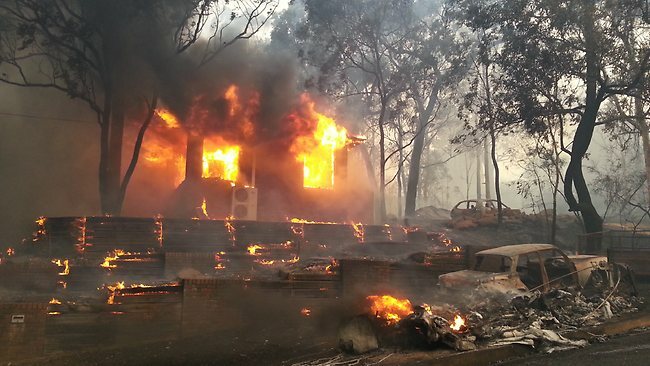 After every Aussie forest fire, every report comes to the same conclusion. All the deadwood fuel should be be burned off during the wet season. The greenie meanies have prevented this every time; the fires are manmade, by the greenies. so with the greens the ‘nuttier’, or more green you are, the quicker you are to being fired or voted out, despite the fact that they encourage people to be more ‘green thinking’. This is a strange paradox don’t you think?. “Green thinking” … immature thinking ? I was really considering nuttiness as a personal trait rather than the belief in any particular ideology. Slightly nutty people may suspect that other people see them as nutty… where as completely nutty people think that only a nut could think they are nutty… and if all that sounds nuts then so be it! Hey lets habitat Mars and introduce a carbon tax to reduce the carbon dioxide. Terra forming by taxation!!!! An absolutely brilliant cartoon by Bill Leake in The Australian today (19 October) which digs much deeper than a first perusal would show. Adam Bandt spouting green nonsense about the need to worry about climate change, being knocked over by Abbott rushing in with a fire hose taking “direct action” to put out a fire. The green party would like us all to waste our national wealth on .000000634% of a degree (or whatever) of global warming, and make no real effort to prepare for climate variability, natural dissasters or adverse weather events. The message is getting out. 1. Australian bushfires are so natural that the seeds of some Western Australian wildflower species won’t germinate unless a fire has passed over them. The perfect putdown for Bandt. Good one! Cop that, AdamAnt! Makes me ashamed to wear a suit to see a North Fitzroy trendy like Bandt wearing one. Saddened to see the consequences of nature unchecked and toxic-Green policies exacting their self-righteous, faith centered, cost. The images on the MSM said it all. Houses encased in continuous greenery. No fire breaks, no clearence. Perfectly at one with nature and tragically, at one with the inferno. What causes BushFires in Australia? You could talk about it for ages .Whats new about them ? For one ,the fatality score is so low so far ,thats incredible considering the weather and property damage .But is it unusual ? Is the weather any different ? While poor old NSW was getting the hot wind ,in victoria we were getting hail and coldish winds .One hundred years ago in Bass Strait it was reported in the Warrnambool Standard that the weather was bad in Bass Strait and passengers copped it during the voyage from Melbourne to Warrnambool . So ,today we are experiencing the same weather endured 100 years ago down here in Victoria .When I was looking through my books yesterday a weather report from 1950 fell out of a book .It looked like one from the Melbourne Sun and it too reflected a typical winters day in Australia both in NSW and the rest of Australia . How does he explain all the fires on record throughout Springs and Summers of the past,eg 1939? I thought the GW mantra held that industrialisation since the WW11 had caused the expansion of the human caused CO2 in our atmosphere which is the whipping boy of the doom sayers. Wouldn’t it be great if the doomsayers would argue even one or two aspects of the science that is supposedly “settled”?THAT is standard scientific practice after all, or should be! I’m sick & tired of these green zealots attempting to make mileage out of others misery. Problem is no one holds them to account & they can spew this crap continually. In my region of midcoast NSW, every single month set its hottest (av max) record between 1910 and 1919. The exception was August, hottest in 1946. Like a lot of other people, we were driest in 1903, but the whole half century after the Fed drought was low on rain overall. Just as well we had a timber industry. When you get good years, like now and in the seventies, there’s plenty to burn. Duh. And the most likely time for a burn is when winds are high after a dry August-September. Duh. Anyway, all credit to our firies, Abbott included. Great job. For a ‘Greenie’ doesn’t Bandt know that fires are a natural phenomena crucial to Australia’s ecosystem? Native plants such as banksia and xanthorrhoea require smoke from ‘cooler’ fires for the their seeds to germinate. Australia’s Indigenous have used back-burning for centuries for hunting, and as a result, plants have adapted and thrive through enriched carbn rich soils left through slow burning. Without back burning we are left with catastrophic, intense heat fire that destroys ALL flora and fauna including beneficial soil borne micro organisms. Yes, hot days are a contributing factor with fires, but it is the build up of organic material left without slow burning that adds fuel to devastating fires. To simply blame hot weather is ludicrous. To politicise it is moronic. I was watching Annabel Crap on the ABC tonight…”The science is in. Climate changes causes more bush fires…” I was so disgusted I started watching reruns of “Dad’s Army” just to calm me down. Then a horrible thought occurred to me. Can you imagine what would have resulted had these bush fires occurred during the lead up to the federal election. I reckon we could have had another Labor gov – similar to the Hurricane Sandy effect during the US elections. You’re something of an idiot, aren’t you mate? And most of your pals here as well. Sigh. I just wish you were right. But you find yourself on the wrong side of history, my friends. I didn’t bother to bring my A game arguments as I don’t see anyone on here capable of rational analysis of the evidence. People should be held responsible for their misinformation. And Yes! my information is strongly supported by genuine science.